This first window in the sequence was executed by Tiffany and honors Evelyn Hayden Phillips. This window is the depiction of the Abrahamic Covenant. The scene in the lower panel shows a heel upon the head of the serpent which is a reminder of the story of the Garden of Eden. This carries the symbolism that from the very beginning all the way through history every person who has ever lived, including each of us, has had a struggle between good and evil. In the center panel of the trefoil God is speaking to Abraham. The Lord said to him “I will make my covenant between me and you.” God is represented by the shaft of light coming down from heaven. God is saying to him “If you will go out of your country and from your kindred and from your people, I will make of you a great nation and will bless you”, and Abraham is accepting this covenant with God. This scene depicts a man of strong character who hears God speak and carries out God’s directive throughout his own life. The right panel shows Sarah, his wife, who doesn’t know what the voice means, doesn’t know what is happening, but is perfectly willing, as shown by her stance and her clasped hands, to go with Abraham wherever he leads her. The left panel shows Abraham’s nephew, Lot. He is a busy man, too busy to be bothered by spiritual matters. He has his sheep around him, grazing and drinking from the stream. While God spoke to Abraham, Lot tended sheep. Abraham, however, hears God, obeys His voice, and ultimately, establishes the people of Israel. They all share the Blessing. The small scene near the top shows God’s hand blessing Abraham. That blessing endured throughout all the years of Abraham’s life and indeed throughout Jewish history until Christ gave us the new covenant. 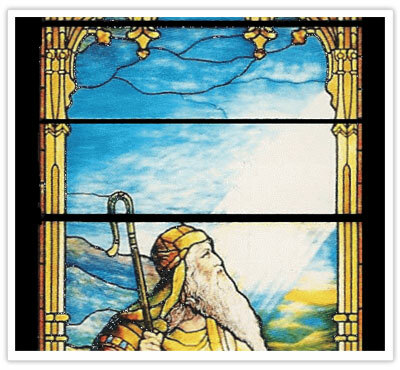 The symbol in this window which perhaps is most important of all is the beam of bright light shining upon the uplifted face of Abraham who is upon his knees. It is the sign and token of the Presence of God in Covenant Grace. Abraham is represented as a person of striking appearance, large, deeply interested, and definitely responding to the call of God.